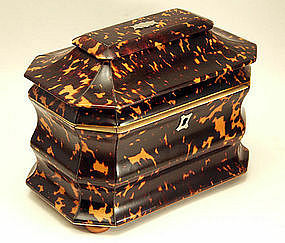 Fine English Regency Break-Fronted Tea Caddy in “tiger” tortoiseshell having a pagoda shaped top opening to two lidded compartments, a shaped front and bun form feet. Circa 1815. Repairs-mostly to back. English Regency tortoise tea caddy with pewter stringing and serpentine front with pagoda-form lid opening to an interior with two compartments with shell veneered lids, the whole raised on stained squashed ball feet. Antique American Salt Glazed Crock with leafage decoration. Approximately a half gallon. 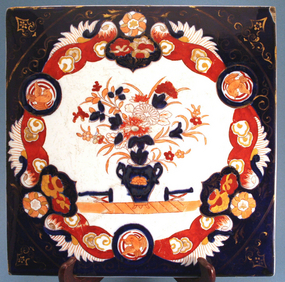 Circa 1850-70. Unmarked. 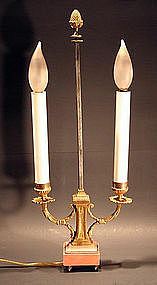 Fine small pair of antique French ormolu and marble candelabra, circa 1870, now wired as lamps. Rookwood pottery globular form vase with turquoise glaze and moulded leaf form decoration. Base incised with Rookwood logo, dated 1948, pattern #6632. 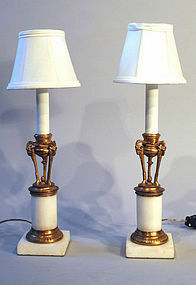 Nice small pair of antique French ormolu candelabra with rose colored marble bases, now wired as Bouillotte lamps. Circa 1880. 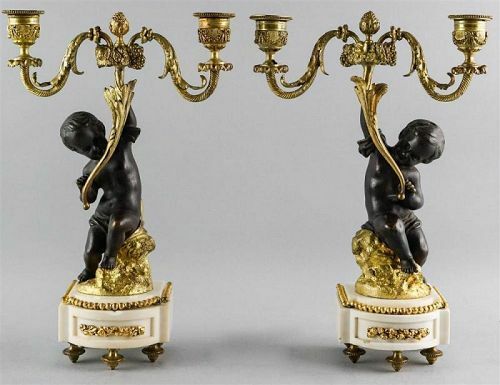 Most likely French, nineteenth century. A nineteenth century imitation of what is most likely supposed to be an English enamel snuff box from Birmingham, much like 5218-27. However, upon comparison, it becomes obvious that the nineteenth-century box is lacking in size, detail, and quality. Restoration to body, cracking to all parts, color loss and minor restoration to lid. Susan Benjamin. English Enamel Boxes. (1976). 18th Century English Porcelain Tea Bowl and Saucer, possibly Thomas Wolfe & Co., Liverpool. Circa 1780. Antique Benningtonware covered teapot with moulded decoration of ‘Rebecca at the Well’. American, circa 1880. (minor chips to spout). Small pair of Rookwood vases with Southwestern motifs in a tan glaze. Bases impressed with Rookwood logo, dated 1948, pattern #6762. Fine antique Chinese baluster form sang de boeuf vase. Late 19th/early 20th century, now wired as a lamp. Antique French miniature prie-dieu in rosewood with fretwork top opening to a small compartment, turned supports and a base lined kneeler opening to reveal a hidden drawer. Circa 1870. 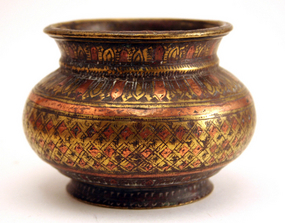 Antique Brass or Bronze Iota (an ablutions pot) having incised and inlaid copper checkerboard and leafage decoration. This type of metalware is known as Ganga-Jumna. Ganga meaning Ganges river, and Jumna meaning Jumna River. It is Brass and Copper because it reflects the color of the two rivers mentioned. 18th-19th C. probably from Moradabad in northern India.